Santa María de Tigre has easy accesses, railways and highways, making it an ideal place to live, away from the noise but close to everything. With peacefulness and privacy as fundamental pillars, it gathers people with the same life philosophy. People that are searching for a quiet and safe place, at a coherent distance from the Capital City, close to shopping centers and schools, but away from the urban stress. 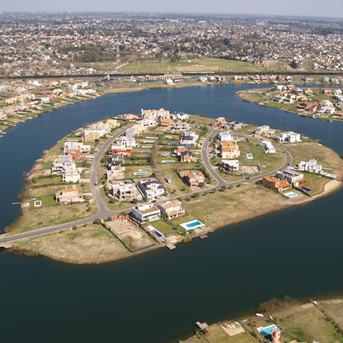 Santa María de Tigre also has a wonderful lake of 8 hectares and a mini harbor with 300 moors having an important access channel to Luján River. Its interior bay creates an excellent resting spot and offers visitors a privileged landscape. The lots are surrounded by large green extensions and they enjoy the garden design with noble and thick trees. Besides, the development has a space reserved for a future school, a shopping center and a chapel. At a distance of 2 km from Tigre, entering though Route 197, we find Santa Bárbara. 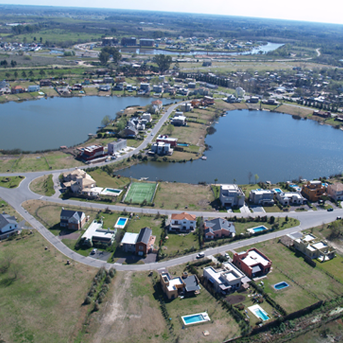 A development located only 30 km from Buenos Aires, offering a fluent communication with the surrounding areas thanks to its numerous accesses. 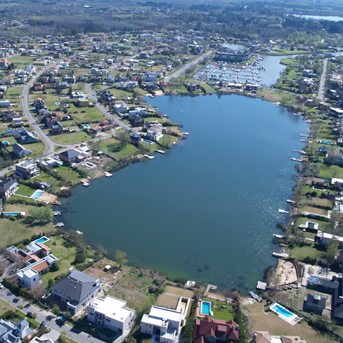 Besides highways and side roads, Santa Bárbara offers the advantage of being next to the urban nucleus of Pacheco, ten minutes from Tigre train station and only five minutes from San Isidro´s Horqueta. It proposes a unique design with a great number of its lots harmoniously arranged around a wonderful lake of 64 hectares. Between islands and peninsulas, it perfectly combines water and land achieving a relaxed and attractive landscape. 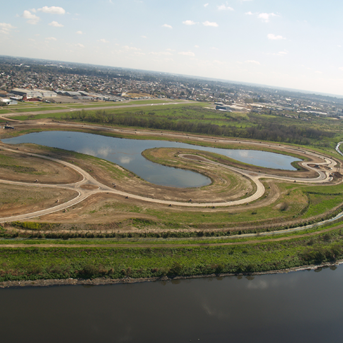 The main network of roads was designed as a large Boulevard winding around the different areas of the project. It has, besides, two wide access roads at the ends which allow a safe and fast circulation, communicating the driver with a couple of small shopping centers , one of which also has a chapel and common service areas. Santa Bárbara is a place with wide lots of land and plenty of green areas, giving its dwellers a pleasant feeling of privacy and peacefulness. Its surface (30 hectares) turn it into a small scale development which creates in the visitor the feeling of an intimate and comfortable place. Since more than half of the project has been destined to common areas, Altamira enjoys large extensions of green and water. It offers as characteristic feature the fact of being linked by two central lagoons, communicated by internal roads which offer a constant view of the lake while running along them. Its lots are broad and spacious, carefully designed so that more than 50% of them rest at the shores of the lake. Altamira has decided to create a garden design respecting the traditional Tigre landscaping, recovering species of resistant trees which are native of the Delta.